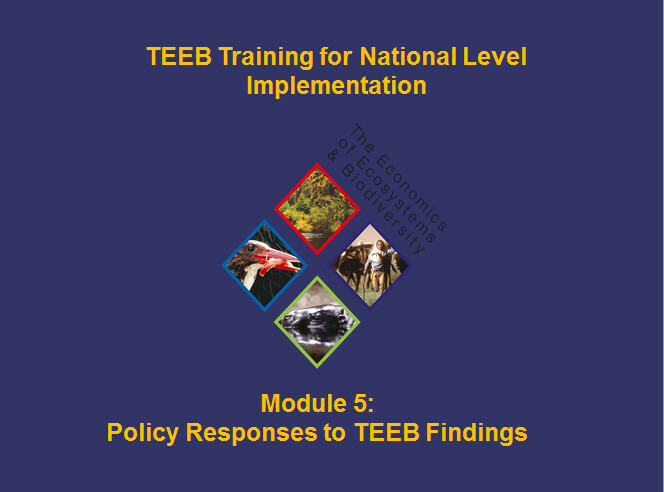 This module aims to demonstrate the importance of responding to TEEB findings and provides a range of different policy options and instruments that can be used for improved stewardship of natural capital. Session 1 Integrating ecosystem services values into decision making This session discusses in detail the importance of integrating biodiversity and ecosystem values into decision making processes. Learning on the TEEB approach (recognize, demonstrate and capture), the session introduces and identifies some of the policy options/instruments that can be used to respond to TEEB findings. Session 2 Instruments for improved Stewardship of Natural Capital This session explores in more detail the range of policy options/instruments for improved stewardship of natural capital that were introduced in the first session and provides case studies examples of where these responses have been applied. Session 3 The Road Ahead This session considers the road ahead and what the next steps are for those stakeholders wishing to undertake a TEEB study etc.